Tetrahydrocanninol (THC) and cannabidiol (CBD) are two of the most important naturally occurring cannabinoid compounds found in Cannabis sativa plants. Cannabis sativa is the most common species of the Cannabis genus of plants and has been cultivated by humankind throughout history. THC and CBD are often confused by the general public, and most people tend to think about the euphoric high when discussing cannabis. However, the cannabis-educated readers may already be aware that THC is known to induce the notorious “high” which recreational users seek to experience, whereas CBD is entirely non-psychoactive while it provides numerous potential health benefits similar to those associated with THC. Since CBD is non-psychoactive and associated with lower health risks than THC, it is utilized as a preferred ingredient in dietary and natural supplements nowadays. 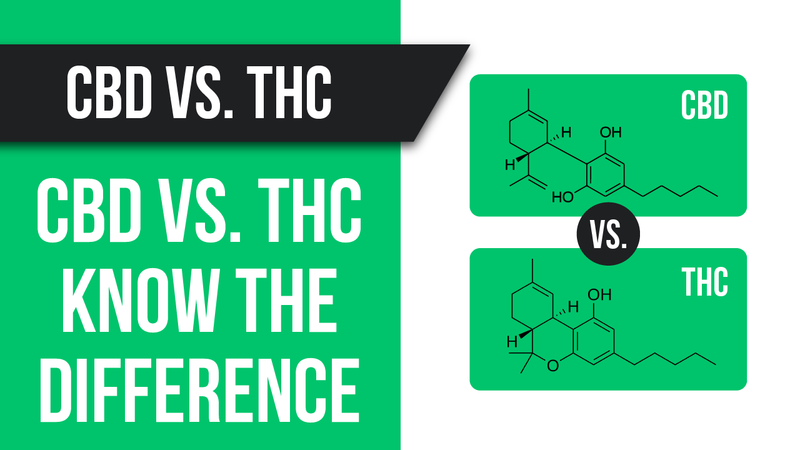 You may be wondering about further distinctions between these two common cannabinoid compounds. Do you want to find out which of the two cannabinoids is better for medicinal and personal use? If so, let us deep dive into this topic without further ado. Both CBD and THC are composed of 21 carbon atoms, 30 hydrogen atoms, and 2 oxygen atoms. However, the distinctive arrangement of a single atom is what differentiates the two cannabinoid compounds. In particular, CBD contains a hydroxyl group, an oxygen atom bonded with a hydrogen atom, and an open ring structure whereas THC contains a cyclic ring at the same position. This essentially determines the effect of each cannabinoid on the human body. While THC binds to the CB1 receptors of the endocannabinoid system (ECS), CBD does not. This, in turn, results in the psychoactivity of THC and the non-psychoactivity of CBD. Furthermore, CBD can even neutralize the psychoactive effects of THC by negating the bond between THC and CB1 receptors in its vicinity. CBD and THC both provide a plethora of health benefits, but not everyone is keen on the mind-altering euphoric effects produced by THC. On the other hand, CBD delivers nearly the same benefits without inducing the psychoactive “high” state. Some preliminary research favors CBD when it comes to inflammation and neuropathic pain, whereas THC might be a better option with muscle spasticity and cramp induced pain. Consuming large doses of THC at once can be counterproductive in this context, i.e. it may worsen the pain symptoms. Some patients also experience difficulties in managing the side effects of the psychoactive cannabinoid. Thus, it is important to consume small amounts of THC when attempting to alleviate spasticity and cramping. Experts suggest that an optimal response for chronic pain may be obtained by combining CBD and THC, which is often referred to as the entourage effect in the field of cannabinoid therapeutic treatments. The entourage effect is a simple mechanism by which the cannabis compounds work in synergy to produce a specific effect on the body. This is the reason why CBD oil from cannabinoid-rich marijuana is thought to be more medically beneficial than the hemp-derived CBD oil which lacks terpenes and some of the other compounds. However, agricultural hemp is much closer to the varieties growing in the wild, whereas marijuana with a high CBD content is hybridized to generate the highest level of the desirable cannabinoid compound. Marijuana-induced anxiety disorder has been reported by some recreational users. Thus, when treating anxiety it is important to prioritize high-quality CBD extracts over psychoactive THC. CBD has a calming effect and has been shown to alleviate anxiety. In this case, the entourage effect does not occur since THC may exacerbate the issue rather than create a synergic response when combined with CBD. Needless to say, CBD is king when this use case is considered! Finally, the following section sheds some light on the controversial and complex topic of the legality of CBD and THC. THC has been classified as an illegal substance in most of the world including the United States. However, some states in the United States have recently legalized both marijuana and hemp which are associated with high THC and low THC content, respectively. In these states, both CBD and THC are fully legalized. Generally speaking, usage of CBD is much safer from a legal perspective even though some issues may arise due to the ambiguous laws and the close relationship of CBD with THC. The 2018 United States Farm Bill was passed by the Senate on Dec 11 and on Dec 20 it became the law. This latest edition of the Farm Bill confirms that hemp-derived CBD is federally legal. Since marijuana remains federally illegal, marijuana-derived CBD is not legalized on the federal level. However, the federal law does not overrule the state law, meaning that marijuana-derived CBD is actually legal in the states which have legalized marijuana. To summarize, hemp-derived CBD is legal in every state, while marijuana-derived CBD is illegal everywhere except within the states which have legalized marijuana in the first place. It is evident that significant progress is being made toward adoption of cannabis and its cannabinoids and the regulatory landscape is shifting rapidly. In a few years’ time, we may witness the all-encompassing legalization of CBD and THC on a federal level. In conclusion, two of the most popular cannabinoids share a significant number of features but they also may be distinguished by their chemical structure, psychoactivity, and legality. It is important to note that neither CBD nor THC is better than the other – both cannabinoids offer tremendous health benefits and may alleviate chronic pain, inflammation, anxiety, insomnia, epilepsy, diabetes and so forth. The euphoric high produced by THC can definitely be considered as a negative side effect, although some recreational users seek to experience it. CBD can be used as the safer, more legally friendly alternative if no psychoactive effect is sought after.